With her cuffs of invincibility, her invisible plane, and her lasso of truth she's the best crime-fighting woman in town. Wonder Woman, the great and glorious Amazon from Themiscyra, is the fearless and first female member of the Justice League. She's taken on some of the toughest enemies on the planet and fought beside everyone from Batman to Superman. And not only does she have a long list of incredible superpowers, but she's also a determined warrior and her years of training have made her a top-notch tactician and martial artist to boot. And have we even mentioned how fantastic her hair is no matter how many bad guys she's beating up? Phew. This lady has really got it goin' on. 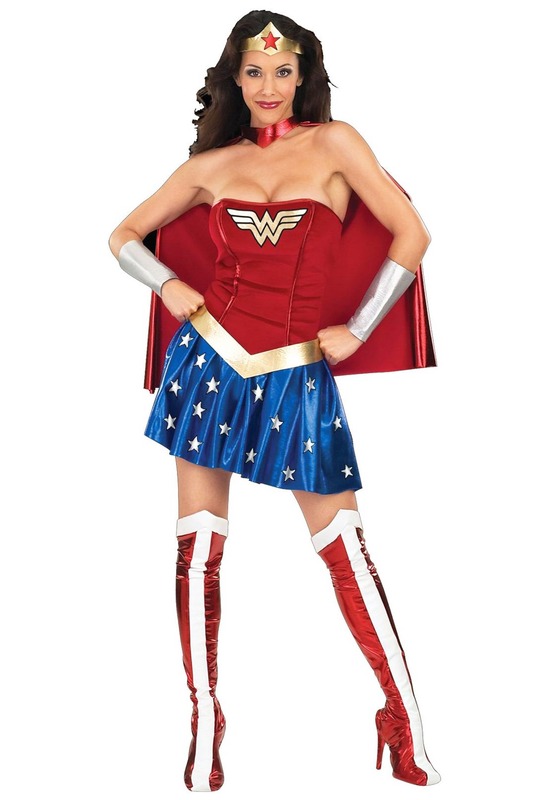 You can show off your own awesomeness and strength with this officially licensed Wonder Woman costume for women. When you're rocking the iconic outfit, you'll be the one in charge, and you'll have the confidence and respect you deserve. We can't help you with the superpowers—yet—but we are currently exploring funding a search team to get to Themiscyra to get the lowdown. For now, we'll just hook you up with the red, white, and blue dress that lets the villains and everyone else for that matter know that you're the go-to superhero for any situation. We also have costumes for everyone else in the Justice League, too, so get a group of friends together for that for an epic group them. And may Hera guide you! Runs Big: Please make sure to double check size chart, fabric has stretch. The only thing missing is the "Lasso of Truth." For the price, and realistic expectations of costume quality, it's a good buy. Follow the sizing guide. The boot covers give a good illusion, but I had to pin them to keep them up on my legs. They fit better over heels than boots. They started to rip after two wears. The head band and bracelets make the outfit. I got lots of compliments and the outfit was wholly recognizable. It made for fun times. Was this review helpful to you?YesNo6 people thought so and 0 didn't. Gave this as a gift to my sister - a big WW fan-- She loved it. I have not seen it on her yet, but I already know it will need a little adjusting with a bit of elastic here and there. Any costume like this is not going to fit everyone perfect...I would plan ahead so you have time to sew or adjust in other ways with pins, etc. This costume looks exactly as it is pictured, the only advice I have is BE CAREFUL WITH THE MEASUREMENTS! I measured myself again before purchasing just to be safe--when I tried it on, it was way too big and I'm going to need to get it tailored so it isn't falling off of me. Considering wearing garters to hold up the boot covers! Overall, great costume, happy with my purchase! The costume is okay, but the sizing is a little off. I normally wear extra small, but got the small based on the size chart. It's hard to get over the hips, but otherwise fits okay. The material (except the skirt) is not as pictured at all. It's a fuzzy material, not the sleek fabric shown in the picture and the belt and headband are not shaped as pictured either.... then there's the boot covers.... same material as the top of the dress (fuzzy) and they don't fit well over boots or heals. I'm going to have to find a way to make them stay over the shoes/toes... Not sure if I'm going to be able to handle the cape, it's tight around the throat. This is a great costume sizing is true to what it says!! !